Online Reviews - why you need them, where to find them and how to respond. 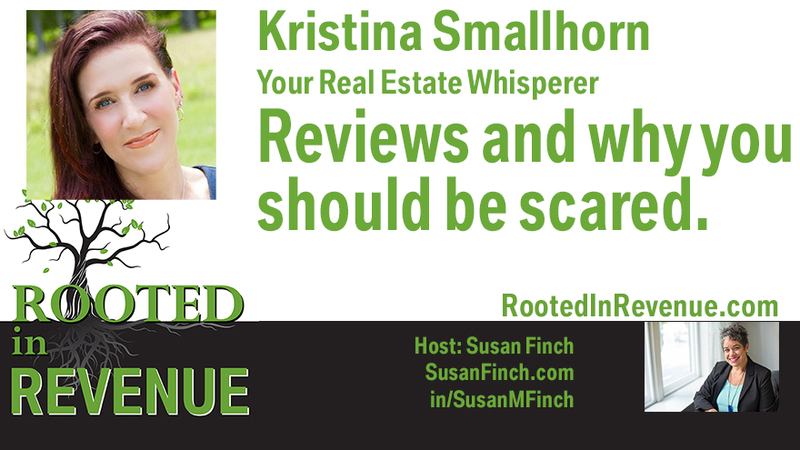 This lively visit with real estate agent, Kristina Smallhorn applies to all businesses who need and receive reviews. The video version linked in the bottom will have some how to tips, too. Business reviews are not just for B2C and brick and mortar. ALL businesses need reviews in the right places where their potential clients go when considering them as as solution. This, along with what their colleagues and friends recommend play the biggest role in decision making before they even contact you. My guest is Your Real Estate Whisperer, none-other than Kristin Smallhorn, a successful real estate agent in Louisiana. Her engaging YouTube channel is how I knew she was a great guest for this topic. But videos are what you EDIT and produce. Reviews - we do not control what people post. We can hope, we can ask for them when we have a successful transaction, but ultimately, we cannot control what others say about us - this gives reviews more credibility. Why do you think some businesses don't pursue reviews? Well, you may be surprised. OK, listeners, put on your big kid pants. Reputation provides interaction. AND business reviews provide valuable feedback for businesses. Business reviews and social posts help shape a company's online reputation. AND, if you don't like what's being said, well, it may be time to do it better. Your problems are bigger than what people are posting. That's just the result of the issue. Are you are sure you know where they all are? What about when you get a bad review? How do you respond and how quickly? Were you able to turn any around to either remove them or update them to something positive? Have you converted any bad reviews into clients or advocates? PIE IN THE SKY hopes! We cover a couple of stories in this episode you may be able to relate to or find entertaining. What you do to get reviews and testimonials from clients? How do those play into your conversion rate? 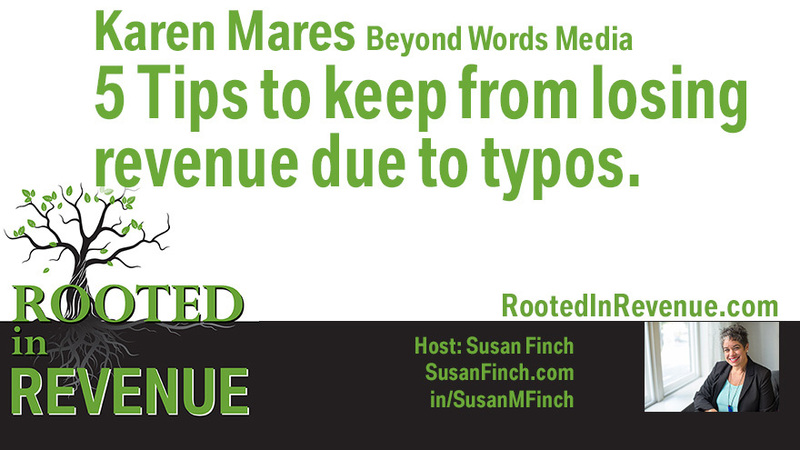 How do you share reviews with your target farm, audience without constantly blaring the "LOOK AT ME! I'm GREAT!" horn. Time for your do to list, listeners. Where to look for your existing reviews? Look on your Facebook business page. Your Google My Business page - the right hand box. You can also do a search on Yext! without signing up - you'll get links to all of your current profiles and can see what others see. For service providers (contractors, roofers, cleaners, etc. ): AngiesList, HomeAdvisor, NextDoor if it's popular in your area. Of course you want to get reviews concentrated on the most important online review sites. That's why we recommend you focus on no more than five review sites total. Which comes first - the why or the how in the first presentation? 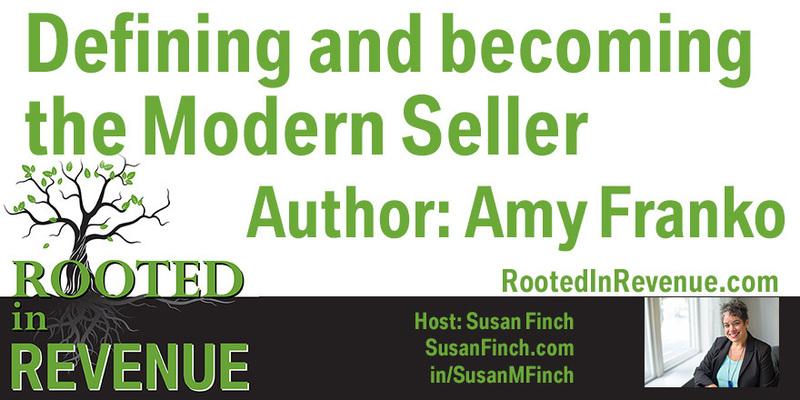 Susan welcomes back author and impact training expert, Amy Franko, as a follow up to the book launch episode for The Modern Seller. Update on her book, wildly successful launch propelled her into the number one position for Kindle downloads in the category of Sales Techniques. We've continued to follow her tips, posts, appearances and the topic of The Why and the How came up. Her blog post titled, "What Distinguishes a Standout Seller?" led to this interview. There is not one answer, but Amy helps you determine the questions to have ready in order to guide the meeting, the presentation and ultimately - THE SALE. Be sure to sign up for her newsletters, guides and more. Definitely worth adding to your weekly research list for those AHA moments. 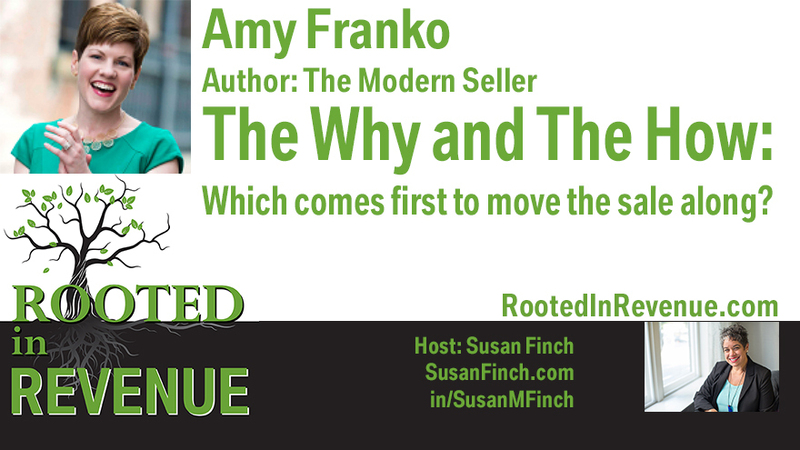 AmyFranko.com - you will find her book, The Modern Seller there as well. When your voice drives the sale away before it started. Take a breath. Really, take a deep breath before you pick up the phone. While you're at it raise your arms, lower your shoulders, sit up straight, smile then make that call, walk into the meeting, take the stage. Speech patterns and bad habits can tune your audience out, even an audience of one, before you get further than your introduction. This will cost you revenue and waste everyone's time. 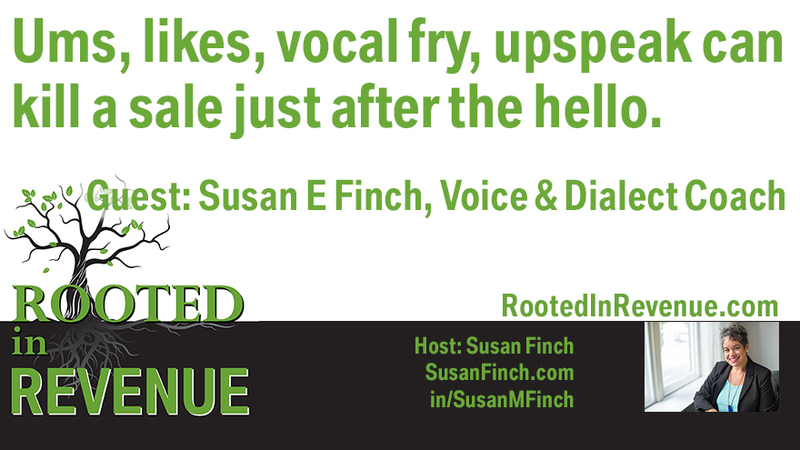 Take tips from voice and dialect coach, Susan E. Finch. This show should have been a video - it was so much fun and packed with applicable tips to keep you from being annoying. The biggest culprits? Women! Women 17 - 35 and this voice fry issue where they sound like they are swallowing their words. Next, the gutteral hiccup - that punch that only belongs in the Cockney community in London. How about the fillers: Like, ya know, sooooo, and.... um, uhhhhh? Time to break yourself of those habits. They scream insecurity and require your listener/audience to strain to get to the point you are attempting to make. When we need to hire someone, we go through the interview process, background checks, checking to see if their past is linked to a bunch of workman's comp cases with former employers.... but once we decide to hire them, do we assume they are articulate? Do they know how to present ideas to their new team? Clients? Speak on behalf of the company? Why don't we teach our staff how to think on their feet and respond articulately? Surely there are Toastmaster's chapters near you. Give them bonus points for going through it or pay for it for them. You'll be glad you did. You'll give them confidence. AND if they really have bad habits, consider a speech coach, like Susan E. Finch. These professionals can quickly identify and help them work through bad habits. May not hurt you, either. Susan suggested the movie, "In a world" from 2013. GREAT examples you can remember. It's about the voiceover industry. RECORD yourself to see how you sound. Use video if possible. Introduce yourself to you. Would you buy from you? Would you want to slug you? Would you TRUST you? Really listen and ask an HONEST colleague to do the same and give feedback. Do it for your department. You'll all benefit from this improvement. About our guest, Susan E. Finch. 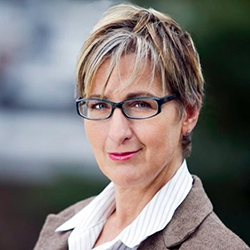 Susan Finch is a voice and speech coach who is passionate about supporting people in becoming clear and connected communicators. As her background is in theater she is able to bring vitality and fun to her clients. She coaches people how to communicate with confidence and excellence. When to outsource sales training to jump start growth. Hey CMOs, CEOs how do you have your SDRs embrace an external group of SDRs to train your existing team on how to secure that first meeting and take it to conversion? 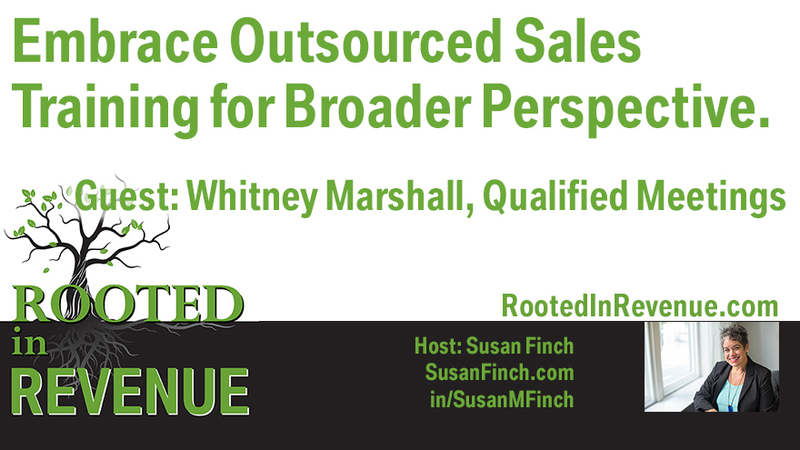 Our guest is Whitney Marshall, Co-Founder of Qualified Meetings. Their goal is to operate as an extension of your sales team – our only goal is to convert highly qualified opportunities that meet both of our standards. Why wouldn't you invest in a proven process and full-service program that will predictably grow your pipeline, while simultaneously providing data intelligence, resulting in an improved go-to-market strategy based on real data and conversations? Or do you think hand your reps a call list, sitting them in the corner telling them to dial their little hearts out and close deals is enough training? As a skilled professional, Whitney has extensive, in-depth experience specializing in Sales Development from a Client Engagement perspective. As the “foundation builder” for some of the most successful Sales Development programs in the IT industry, Whitney has developed and refined processes that ultimately lead the Sales Development program to be repeatable, scalable and continually functional through any employee changes with the utmost visibility and accountability. “Working with companies who struggle to put intelligent process and standardization around outbound prospecting has provided me with a wealth of knowledge of this ever-growing commonality in organizations today. As industry sales approaches evolve with new methods and best practices, a program that can maintain integrity, revenue contribution and expansion through these changes has proven to be a critical component lacking in a growing number of businesses. With qualifiedMEETINGS, we are able to customize, implement and manage a process that is repeatable and scalable, all while providing intelligent analytics and the highest qualifiedMEETINGS for our customers’ pipelines”. Whitney began her Client Engagement career with ForeScout Technologies where she co-developed, implemented and managed a program that streamlined onboarding, lead transfer, opportunity creation and analytics which was the foundation for exponential growth in new logo acquisition. Recently coming from CollabNet where she introduced and implemented the program management process for Sales Development, Whitney is bringing this highly sought after expertise to qualifiedMEETINGS. Her knowledge expands to companies that want to grow their pipelines year over year with a program that has proven results. 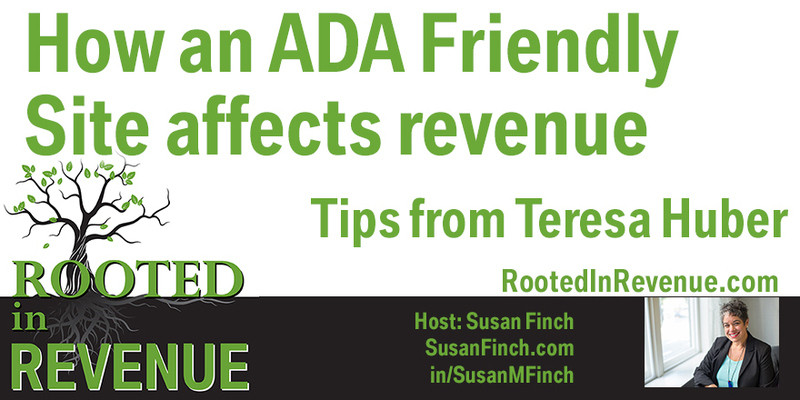 Teresa Huber and Susan Finch talk about the importance of an ADA compliant website. When most marketing departments think of disabilities and ADA compliance, they think about blind people, those in wheelchairs and more obvious issues. Don't forget about those with dyslexia, those who are color blind, hearing disabled. You may not realize how much of your buyer personas include people with a variety of disabilities. Why would you want to exclude them from viewing your site, doing research on your site and ultimately paying for your product or service? Join us for some interesting facts and example, as well as tools to do a quick assessment of your existing sites. Visit her website - you will learn VERY interesting facts immediately on the home page. Tools for quick assessments so you can initially know, "... just how bad is it?" Website accessibility gives equal access to everyone, no matter their physical or other limitations. Website accessibility also ensures businesses, schools, federally funded organizations, and government agency websites are complying with the Americans with Disabilities Act - ADA and Section 504/508 of the Rehabilitation Act. 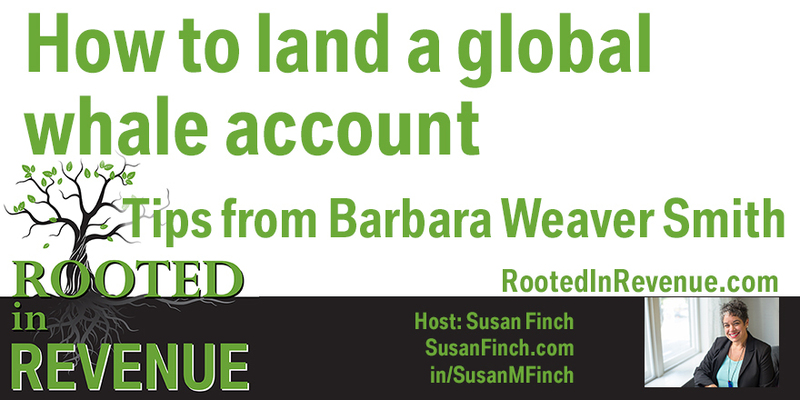 Author, Barbara Weaver Smith joins Susan Dec. 6 for this episode (listen live on this site at the right). Her first book, Whale Hunting, exposed us to how to succeed in landing larger accounts. Whale Hunting provides your B2B company with a clear, step-based model for successfully finding, landing, and harvesting whale-size accounts–the kinds of accounts that transform your business. It can mean the difference between merely surviving and thriving spectacularly. But you have to be smart and you have to be prepared! In this episode we go to the next level: Whale Hunting for Global Accounts. Some of the tips covered help you get in the mindset and secure your partners and team to handle this global accounts. Changing your thinking of your business and your clients is the most critical piece. They are ready to be global or already are. You need to make sure you fit into that picture to enjoy a bigger version of your current status with them as a supplier. Be the solutions for ALL locations, all divisions. Expanding your team will most likely be necessary. BUT your clients may have more in place to assist you than you realize. Time to make some new partners, as well. EVERYONE can grow and be more successful with your new mindset, including your clients. AND you will build strong loyalty from them. Listen in and take notes. Selling to Healthcare & Hospitals - you need to be able to understand all the terms. My guest is Heather Williams, the Vice President of Business Development at Strategic Dynamics, Inc. Heather helps organizations sell more effectively to their customers . She works with several healthcare companies but also works with other industries as well including finance. Heather works with senior level executives and HR to ensure organizations are hiring the right talent for all positions. Today we are discussing her book, “Selling to Hospitals & Healthcare Organizations. To sell effectively in this new ecosystem today’s sellers must understand the role and function of hospital and alternate site personnel and their language. We call this Business Acumen. Sellers that understand the language and business of hospitals receive immediate credibility, which is a foundation for building communication and trust. As hospitals migrate from a fee-for-service reimbursement methodology to payment for value, based upon patient outcomes; they are creating new business models and new relationships with insurers, physician practices, single and multi-specialty community clinics, ambulatory surgery centers, diagnostic imaging centers, specialized treatment service centers, specialty hospitals, skilled nursing facilities and other healthcare entities. Buying the book will keep you in the loop for updates and book 2 coming out in 2019. Anyone who is calling on Hospitals or Healthcare Organizations. This includes, sales personnel, marketing, operations (for equipment implementations) or product service personnel. Sellers must understand the role and function of the hospital and their personnel (the jobs they perform) and then be able to speak their language. Private citizens will also find this book useful if they want to increase their knowledge base about healthcare organizations and personnel. After all we all need healthcare and it helps to be more knowledgeable about our options, the different institutions and the people who deliver the care. How do you use this with your clients? We let them know this is available and a great resource for on-boarding new company personnel who do not have any healthcare experience or who may be required to call on personnel in a new department or entity that was not previously served. 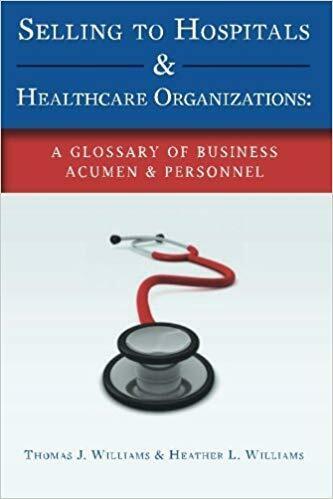 For those that have experience, this is a great resource to keep on-hand as reference There may be a Healthcare acronym that you may not be aware that is in the book. 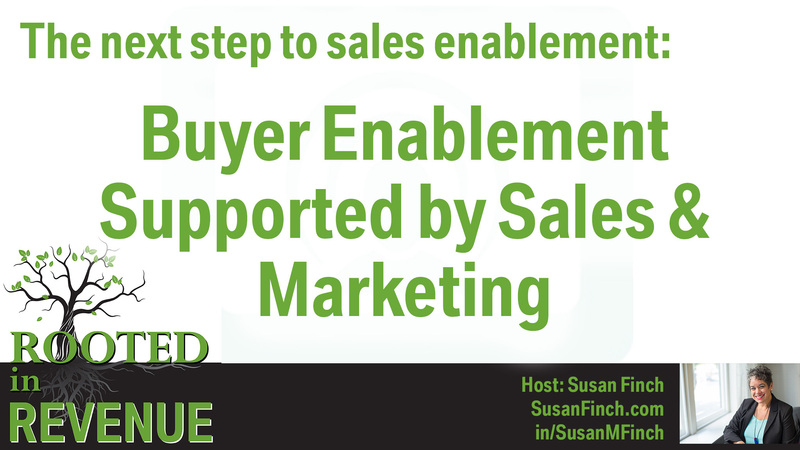 What have you learned about Buyer Enablement, beyond the evolution of Sales Enablement? Modus-built applications are intuitive because salespeople don’t have the time to be trained. Salespeople can customize their presentations and you can create strategies which govern the content users see. Your salespeople in France will only see collateral in French. Your remote salespeople worldwide don’t have the luxury of an online connection when meeting with clients. With our enterprise digital sales enablement platform, all the information salespeople need for the next sales call is immediately available on their tablet, phone, or laptop. What is The Modern Seller and Why You Need to Become One. What makes an ambassador unique.What characteristics make a great sales person? How would you define modern selling? What's changed in the past 5, 10, 20 years? What are some of the biggest trends influencing buyers in today's market? What advice would you give to someone struggling to stay motivated in their sales role? How can sales people continue to develop and keep sales strategies "modern?"